Haven't checked with Conservative Purists who undoubtedly go, "told yah so"; Amanda Head sets them straight. Ye apparently has some issues with Candace and the designer of the t-shirts, but he never said he'd leave the #MAGA sphere. In the meantime #Blexit is going crescendo as Google is caught election meddling! Candace crosses swords with air head Tomi Lahren in an inter-conservative cat fight (Mediaite). ⏩ A little dated but worth the watch, two former liberals discussing how they walked away from the Democrats, Roseanne and Brandon Strake. Here's some more footage of last week's Black Leadership Summit, the BLEXIT (Black exit from the Democrat Party) and the WalkAwayMarch (the exit from the Democrat party of all minorities). Enjoy! "They told us the Republican & Democrat Party switched. That NEVER happened." "If the Dems don't get more than 85% of the black votes they are FINISHED. They relied upon us.."
Oct. 28, 2018 TRUMP INTERNATIONAL HOTEL WASHINGTON, D.C. The march has started. Watch Michael Flynn Junior's Periscope broadcast during the march. RSBN live stream: WalkAway March on Washington, DC #WalkAway. In DC the Black Leadership Summit (see the President's address on Trump speeches) seamlessly morphs into the WalkAway events. So cool that President Trump is endorsing the March! Prior to the March to be held today a dinner was hosted by Brian Straka. More in Jack Posobiec's Periscope. For far too long, the left has controlled the narrative in this country within the news media, while the “silent majority” on the right have done what they always do – remain silent. The left has been allowed to reinforce the narrative that everybody on the right is a bigot, a racist, a homophobe, a misogynist, etc. The left has become so extreme and hateful that it is now time to fight back! We want people on the right to use their voices and tell the world the truth about whom they are by making videos telling everyone what it means to be a conservative in America and what your values really are. Tell minorities on the left, who have been told their whole lives that they are not welcome on the right because of the bigotry and hatred, that they are welcome. Tell them there is a seat at the table on the right for everybody. This is a movement of Patriots from all walks of life – men, women, black, brown, white, straight, LGBTQ, religious, and non-believers – who share something very important in common. WE ARE ALL AMERICANS and we will not surrender our country. President's Trump address to Turning Point USA's Black Leadership Summit on the Live Blog of Trump speeches. Here's more! (VIDEO) ERIC HOLDER: "KICK THEM"
After Hillary, we now have the former AG Eric Holder coming out of the closet as a proponent of political violence. It is where the ideology is inevitably leading. Will to power is the entire point of the Left. Always has been. First of all, it's impossible to sign up a democratic majority of any civilized nation for their revolutionary politics, making a power grab by force the sole road to power. Secondly, reason being beyond their grasp as a tool to knowledge, resorting to irrational means of the will and violence is in the nature of the ideology. If you listen carefully to the apologists, they're admitting as much. So did Hillary. It starts with the regulation of speech and ends with piling up bodies on the alter of Utopia. History has shown this a number of times. Sen. Rand Paul called for Dems. to lower the anti-Trump rhetoric before one of their supporters resorts to violence. CNN called Kanye the n-word then mocked and ridiculed him for seeking treatment for mental. On Mental Health Awareness Day. And no one in the media said a thing. So, let's get this straight! Unless Democrats are in power there's no call for civility in the public domain. But wait. Why doesn't that go for Republicans as well? Why is the ideology of social liberalism absolute? But individual liberty is not? What Clinton is actually saying here, is that social liberalism is absolutely good and who attacks it, deserves the violence he is getting. Conservatism on the other hand has no value (or is actually evil) and must be deconstructed because its followers are against everything Democrats value. In Hillary's mind there's no moral equality between Democrats and Republicans because she makes no distinction between man and his ideas. Liberals are good, Conservatives are evil. The question is therefore, why do these mutually incompatible moral groups share a republic? Or a democratic process? Or even a nation? This is the mindset of civil war! Democrats claim the only way to heal the country is to follow their agenda & if you don’t agree to follow their agenda, you’re divisive. Free thought is not acceptable & if you don’t fall in line violence is permissible. Rep. Steve Scalise was shot. Senator Rand Paul was assaulted. Senator Flake’s staff was threatened. Senators Ernst and Susan Collins were threatened. VP Pence was threatened. So were Jared Kushner and Ivanka Trump. Trump supporters have been assaulted and gunned down. You could go on and on. Street violence and burning cities by BLM and Antifa. Can someone pull up the old YouTube videos of conservatives rioting at conformation hearings when Obama nominated a Supreme Court Justice... can someone show the video at the Hollywood and Music Awards shows where Conservatives got in the face of celebrities for their opinion? Can someone show where Republican senators retorted with "old white men are the problem"? But...the Tea Party! Yes, they were the victims of a technique explained here by Nancy Pelosi. The Democrat two-step with the media called the "wrap up smear" was applied successfully several times in the FBI Spygate operation. You think up a story (a narrative or a slur), you have your mates in the media write a piece about it and hey presto, the story now has the gravity and verity standard of the media. Providing secondarily evidence that the media have now lost all credibility. They committed suicide. It has taken two years, but now the Clintons are going to prove they too can fill stadions with supporters. Well, those willing and able to pay up, anyway. Hilary an Bill Clinton are starting a tour, commanding ticket prices at $700 + each. It got us to wondering how many of you would pay $7 a ticket? (WEEKEND MOVIE) BANNON'S FULL FILM "TRUMP AT WAR"
Sep. 28, 2018 Official Trump At War: Full Movie. Trump At War, a movie documentary by Steve Bannon, is an amazing and detailed accounting of the revolution between liberal and conservative ideologies that took place in the months leading up to the 2016 elections. Most people who followed mainstream liberal media outlets never saw the depth of the actual force and violence exacted against Trump supporters during demonstrations and rallies. This film is a display of the no-holds-barred attacks against his supporters, and a truthful exposition of the efforts to diminish Trump’s message and stop him from winning the election in November of 2016. Bannon, former White House chief strategist, released this movie to chronicle Trump’s road to the White House. More importantly, Bannon says the movie shows why it’s critical for every American who voted for him in 2016 to support him in the midterms. H/t The Western Journal. Aug 24, 2018 Stephen K. Bannon to Release Pro Trump Film Ahead of Midterm Elections. Sep. 7, 2018 Steve Bannon's "Trump At War" Trailer. No sooner had Brandon Straka @usminority of the #WalkAway Campaign announced his #WalkAwayMarch on Washington on October 26-28, or Facebook banned him for 30 days for mentioning the now taboo name of Alex Jones with whom he was announcing an interview. We answered Brandon's call for help, advising him to get off the social media ghetto as soon as possible and build his own website. Apparently people still don't get it. The tech giants are political organizations, hostile to Conservative values and anything related to President Trump. They are not going to let the election of 2016 repeat itself! They mean business. This is the Info War! 1. I just went through my twitter feed and deleted tweets that contained the name of the man who was recently banned on all platforms and the name of his show- all of them except the tweet I just put out which contained his name along with the message that I’ve been banned. 2. This is where we are now. You can have your voice taken away 4 saying a NAME that they don’t want you to say. I will never disappear from Twitter for a day. So if you don’t hear from me for a day or two- they got me on here, too. It is so unbelievable that this is real life. July 15, 2018 Mark Levin sits down with the author of "White Guilt", Shelby Steele. 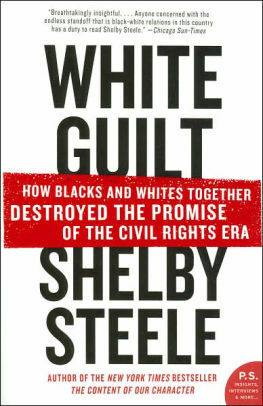 White Guilt: How Blacks and Whites Together Destroyed the Promise of the Civil Rights Era is a book by American author Shelby Steele in 2006, arguing that the results of President Johnson's Great Society, followed by affirmative action and the celebration of diversity were a disaster for black Americans, not only failing to produce racial equality, but requiring blacks to be grateful to white Democrats who now control their lives. Earlier books by Steele are "The Content of Our Character: A New Vision of Race in America", and "A Dream Deferred: The Second Betrayal of Black Freedom in America". This is a Must Watch episode illustrating how Democrats treat blacks that have left the plantation. It entirely breaks the bubble of Democrats being the champions of black dignity: as soon as they disagree, it's back to addressing them as slaves. Bottom line, their heads practically exploded! It was an “Oh man, I never knew” experience”. Kanye West refuses to go away. The integrity of this man can be measured by the risk he's taking by coming out as a defender of independent thought, freedom of speech and Trumpism. Yesterday a poll came out that calculated black approval of the President at a whopping 31 percent, up from 15 to 18 percent just a year ago. If that is true, the Democrat Party is dog's breakfast. Allen West praises the other national treasure, Candace Owens. CAN WE ALL OBSERVE A MOMENT OF SILENCE FOR THE DEMOCRAT PARTY? Update: Various figures are floating around. Here we have Rasmussen mentioning 36%. Candace Owen tweeted 39%. She doesn't give a souce (tweet). Let stick to: shocking! .#WalkAway movement wakes up those who were lied to for 50 years just to get their vote. Rasmussen Poll Reveals that 36% of Black Voters Approve Of Trump;s Job Performance. @POTUS produces RESULTS, not broken promises. ⏩ The new darling of Socialism, is being challenged to debate by Conservatives but she's declining, sometimes citing ridiculous excuses. Aug. 9, 2018 Mark Steyn discussing Vox.com defense of the vicious MS-13 gang. July 26, 2018 Hannity indepth interview with Roseanne Barr. Part 2. Last night Fox News aired the long awaited interview of Sean Hannity with Roseanne Barr. For this she deserves our admiration: in the liberal world of double standards, limitless exploitation of victimhood and intellectual dishonesty, Roseanne comes out of this mess with her integrity fully in tact. People like Roseanne are monuments to free will. They prove that no matter how messy the starting position, humans have the capacity to deal with issues and grow above them. Recently Roseanne came to the insight she was fired by ABC because she voted for Donald Trump. Comedian Roseanne Barr on Friday released a video accusing ABC of firing her because she voted for Donald Trump in the 2016 presidential election. Roseanne Barr may be voting Trump, but she still has liberal ethics as part of her mental makeup. This was her downfall. She truly believed she had committed a mortal sin by calling Obama's hand behind the throne -- Iranian born Valerie Jarrett -- an ape. A Conservative would never have done it in the first place as a matter of taste but, moreover would not have bought into this moral falsehood. Poor Roseanne initially bought the racism charge and she was truly devastated with remorse. But she seems to have worked it out now, reducing the episode to what it was: an attack on a follower of the President. One thing she has yet to learn from President Trump: NEVER, EVAH apologize to liberal bullies; it will just encourage them. (Breitbart). Of course this tirade is not going to do her any good. But at least it cleared her conscience. July 24, 2018 Allie Beth Stuckey satire interview with Alexandria Ocasio-Cortez. Original interview. Liberals can't meme, as @PrisonPlanet is wont to say. First off, they don't have a sense of humor: that requires a proper idea of reality. Worse is that the logic is now prevalent that poking fun at them is somehow not ethical. You must be evil! They get back at you with the censoring apparatus. You'll be lucky to survive the personal destruction that follows. Take democrat commie Alexandria Ocasio-Cortez. She thought memes against her were attempts as FakeNews! There's something else here at work too: they think everyone does the same things they do. This is how you can tell like clockwork what they're up to. This is really all you need to know about liberals: they left the realm of objective reality and instead embarked on sheer partisanship. As the leaders of the Soviet Union used to say, the party is always right! Sweetheart. You think Palestine is being occupied by Israelis & that the unemployment rate is low because “everybody has two jobs”. Please believe me when I say that absolutely NO ONE is afraid of you. #CNN, that crusty dinosaur, is now falsely reporting that #WalkAway is FAKE and WE are 'Russian bots' working against Dems for midterms. CNN has the #WalkAway campaign finally nailed! A writer on CNN claims that #WalkAway gay and blacs grassroots are actually Russian bots. Just so you know! This has two effects. Liberals are setting themselves up for another psychological shock come November. It is one thing to manipulate the electorate, but it takes a special kind of stupid to apply mass delusion to the point of self sabotage. But there is yet another, even more destructive effect for democracy as a whole. When the blue wave turns scarlet, it's the Republicans and Donald Trump claiming to have won another illegitimate election. Rush Limbaugh reduces the problems even further: this is Democrats in the effort of controlling all future elections. From here on every election lost by Democrats is automatically tainted by Russian meddling and/or Trump collusion. Brandon Straka was the guest of Judge Jeanine last night. He explained where he's coming from. While thousands of people with minority identities are walking away from divisive identity politics, the insanity and bullying tactics continue unabated. Liberals just too locked up in their own cocoon to even understand how they are hurting themselves. The Democrats are building narratives that justify violence. HuffPo has one just to illustrate the mental state: "...There is no salvaging the Republican Party. Its leaders are beyond shame, beyond rules, beyond reason. Democrats can speak in the dialogue of peace, but the only dialect Republicans understand is power." (tweet) When was the last time any Democrat spoke of peace? And then they are offended that Alex Jones is saying they're on the brink of civil war! The question is, what else but actual violence remains after expressions like these? 70 Documented Acts of Media-Approved Violence and Harrassment Against Trump Supporters. Tucker Carlson breaking down the Left's Blueprint to take back power from the American People. Democrats started a Go Fund me page for the man who assaulted the teen Trump supporter. The Left is now endorsing and supporting adults who assault kids. Imagine my shock. I see that #SecondCivilWar is trending. Democrats are still really ticked off that they lost the first Civil War. Sorry, Democrats... you're not getting your slaves back! The Left trying to control our thoughts by regulating speech is well known. But liberals are also in the business of telling us where morally superior people buy their food. But why stop there? WaPo is now publishing op-eds opining that the Republican Party "has to be destroyed before it can be rebuild", apparently as controlled opposition. All bets are off at this stage. Here are some of the worst examples of political insanity from the Independence Day collection. (VIDEO) TAKE THE 30 DAY #MAGA CHALLENGE! If you’re black, you don’t have to be a Democrat. If you’re a woman, you don’t have to be a Democrat. If you’re gay, you don’t have to be a Democrat. (12) NOW do you understand the hate? They hate Trump because he's freeing people from slavery. Remember that time when Trump supporters were beaten within an inch of their lives right after the 2016 election & Obama never condemned the violence? This is the trap that people like @CynthiaNixon want young Naive Progressives to fall into. After Donald Trump won the 2016 Presidential elections, the liberal media complex vowed to remove him from office within months. They unleashed the usual recipe of slurs, dirty tricks and media propaganda without as much as making a dent. After two years of investigations even the "inquisition" led by Witch Finder General Bob Mueller is running out of ammunition on the made up "Russian collusion" narrative. The deep state cabal run by elements in the Department of Justice, the State Department, the FBI and the CIA is on the point of having their spy ring publicly exposed. A new grassroots meme called the #WalkAway Movement is slowly but surely emptying the Democrat Party itself; the promised "blue wave" in November is looking increasingly out of reach. The Left reached a new crisis point this week with the news that Justice Kennedy's retirement will fill the Supreme Court with Constitutional Justices for generations to come. Many liberals are now an edge away from openly calling for violence. They often point to the President as the initiator of uncivil rhetoric. But he is not the one who started this. He's so loved by the people because he was the first Republican to finally push back on the liberal bullying tactics. With Democrat rhetoric spinning out of control, the rest of us had better start paying attention! Weather Underground (Wiki) terrorist Bill Ayers has come out of hiding because he is especially fired up about the SCOTUS decision last week, that unions can no longer force non-union Government workers to pay dues. It's made a huge dent in the Democrat capacity to raise funds. Great chunks of the union dues are funneled back into Democrat coffers. Of course the media are making it all possible. There is no noticeable difference between the Party and the MSM. Fake News stories and made up slander are passing for news. The masses are whipped up to the point of mass hysteria. The mindless hordes begin to dance to the violent tune the Democrats are singing. This is by design and the MSM are assisting, truly sick and dangerous. New: The Capital Gazette suspect, Jarrod W. Ramos, had harassed the newspaper's journalists for years. Media members who rushed to falsely connect the Trump Administration to the Capital Gazette shooting should be ashamed. You may not have deliberately misled the public, but you allowed your personal contempt to do so. Only deepening distrust. If you are looking for it, it is possible to discern the patterns, the strategies and tactics. The rule book has been the same for the last half a century or so. More on our historical pages on Left-wing terrorism (Live Blog). Pay specifically attention to entries on Alinsky's Rules for Radicals and the Delphi Method. You don’t have nearly 600 VIOLENT PROTESTERS attacking ICE agents unless someone is organizing it and paying for it. Like I said, this is planned. The Left is planning violence and someone is paying for it. This is happening all around the country today.